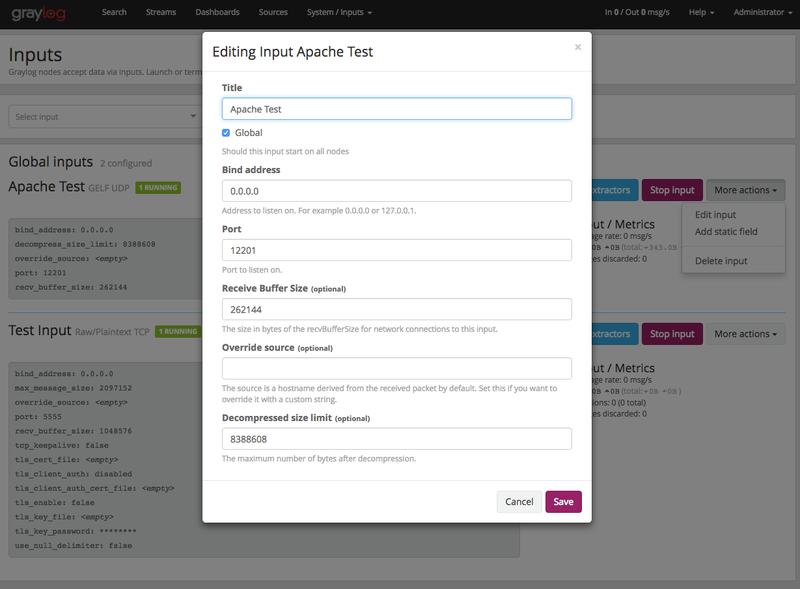 Objective: Configure a Graylog server to accept GELF-formatted logs from an Apache web server. Both servers will be running on Docker, although we will adapt the Apache Docker setup instructions to set up an existing (non-Docker) Apache server running on Ubuntu 14.04. The logs are going to be sent to the Graylog server using UDP port 12201. If using a preexisting Apache server, you could remove the apache block and dependency from the file. You'll just have to mirror the image setup instructions below to get the GELF module installed on your Apache server. For Apache to submit GELF logs to Graylog, there is a community-supported module named apache-mod_log_gelf. I found a clue to fixing this problem here. It was resolved by disabling mpm_event via the command a2dismod mpm_event. The instructions on the apache-mod_log_gelf page were misleading. I overlooked the part that read: "Download a package for your operating system from here Update Apache2 to the latests version and use mpm_prefork." It took me a while to figure out how to get the Apache server to talk to the Graylog server. Initially, I set the GelfUrl "udp:127.0.0.1:12201" but the Graylog server was not receiving anything. The problem was that this was the equivalent to the Apache server trying to connect to itself on UDP 12201. You have to use the bridge network IP address of the Graylog server, or refer to it by the network hostname assigned by the Docker network. Each container has a hostname respective to the name you assign it in the docker-compose.yml file. Build Apache server image: docker build -t wakproductions/apache2-graylog-config .